The Rainforest Garden: A Thai Style Dinner! Though this is a gardening blog, this meal has everything to do with tropical gardening. 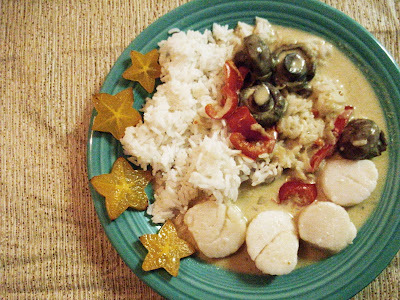 It utilizes Coconut milk, peppers, jasmine rice, starfruit, lemongrass, gingers, lime, mushrooms, and a wealth of exotic Southeast Asian spices. This is to serve as inspiration and not a recipe, but I will include a base for a curry paste that you can add any variety of spices and vegetables to. This is a super easy dish that you can customize however you want, but first here's a little history. Since Southeast Asia has so much coastline and rivers stretched between, seafood figures greatly in their cuisine and incorporates influences from Pakistan to China. Southeast Asian food combines a rich variety of spices with influences from all over the world, thanks to its location jutting out between the Indian and Pacific oceans, and the fabled Mollucan, or spice islands. Moslem merchants have been utilizing these spices in their dishes long before the West did, and they were also the middlemen who profited greatly from their troubles. The spices on these islands were so valuable that when the West tired of paying premiums for spices such as black pepper (related to peperomium), they ignited the European age of exploration and the conquest that soon followed. Eventually Southeast Asian food began to incorporate ingredients of not only Spanish, French and Italian background (Nobody cared to much for British food down there... too bland for their affinity to heat. ), but plants cultivated within their empires from all over the world. So that is why Southeast Asia is a veritable melting pot for the world's best culinary masterpieces. 1. First, simmer a can of coconut milk, adding 2 tbs of curry paste and chopped vegetables and herbs to taste. - You can use any combination of your favorite veggies (peppers are nice), but here are some appropriate choices: peppers, mushrooms, shallots, garlic cloves, potato and eggplant. I used portobello mushrooms, which soaked up the flavor and were succulent and juicy. - Add spices, seasoned to taste: Lemongrass, ginger, curry powder, cardamon, turmeric, cayenne pepper, basil and galangal. Many of these you can grow yourself. I have also used slices of a habanero pepper before, making the dish VERY spicy, but delicious. I recommend one little sliver to heaten up the broth so it doesn't overpower everything else. - Add your starch, to thicken the broth: I used arrowroot, which is related to the Prayer Plant. You can also use taro, or even potatoes or flour if you're playing it safe. 2. Next, Start your rice. - Follow the instructions on the package. I prefer any glutinous rice, shortgrain, and especially jasmine rice. 3. Sautee your meat, seafood etc. I used scallops, but you can use anything you want, including vegetables. Its just nice to have something with a different flavor and texture to complement the curry. I would suggest using some salt, garlic and lime to season it. This makes a great presentation and adds a sweet and tangy balance to the dish. Although I used starfruit, you can also use mangos, pineapple, lime or even peach slices. You can even use a ti leaf, banana leaf, lemongrass stalks or flowers as a garnish if you choose, and I promise it will look amazing. I will probably include a specific recipe later, as soon as I actually get the self discipline to measure all the stuff I throw in there! That is a beautifully arranged dish! I like your descriptions better than a typical recipe. Yum! That looks delicious. I will have to try it. I've never used curry paste before. This will be an adventure. My husband loves spicy food so I know it will be a hit. I have onions growing now and pepper seedlings and eggplant seedlings starting to put out more leaves. This will be a great way to use them when they are ready for harvest. Sounds very exotic and delicious. I especially like the starfruit...very eye-appealing. I love using Thai curry pastes, coconut milk, sesame seed oil adds a nice touch also. Jasmine rice is great with Thai. You've got me wanting to cook up a Thai meal soon. Your picture is very nice and your directions easy to understand for those who may not know what to do. We recently went to a local Asian market and we can buy a large container of sesame oil much cheaper than buying the little tiny bottles at the grocery store. They also have 25 lbs. of Jasmine rice for a good price. We haven't bought any yet, but plan to. My stomach is starting to rumble thinking about Thai flavors. Thanks FlowerLady! I recently discovered how amazing asian markets are, and they're cheap too! I made a huge pot of rice noodles earlier in the month for $2!